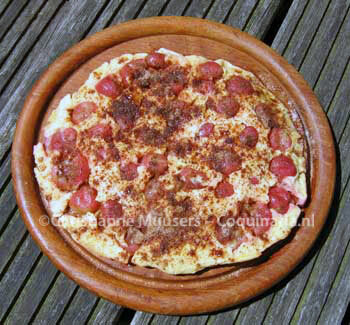 The recipe for omelette (tasey) balances on te edge of what we could name the culinary Middle Ages. It is taken from the Seer excellenten gheexperimenteerden nieuwen Coc-boeck (The very excellent and tried new cookbook) that the physician Karel Baten (Carolus Battus) published as appendix to the second edition of his translation into Dutch from Ein new Artzney Buch (Heidelberg, 1568) by the German Christopher Wirtsung in 1593. Battus supplies us with several recipes for omelette, with smelt (small fish), apples or pears, and this recipe with gooseberries. The use of ginger, cinnamon and sugar is typically medieval. Rosewater is also used in medieval recipes, but was especially popular during the sixteenth and seventeenth centuries. At the end of the sixteenth century the distinction between savoury and sweet was getting clearer, but it was still not unusual to serve a sweet dish such as this omelette together with meat or fish. In a modern menu this dish would be a dessert. The coal fire mentioned in the recipe was used for delicate dishes that burn easily. It can be controlled better than wood fire, and produces less smoke. Even better was the brazier, a perforated container of stoneware or metal on legs in which glowing coals were kept. On the brazier one put a pot or pan, and the dish could be kept warm, or prepared without danger of burning. The picture on the left shows a seventeenth brazier from pewter or silver(plate). There is no modern edition of the Coc-boeck of Karel Baten, but on this site you can find a transcription. Om een tasey van stekelbesyen te backen. Neempt versche boter ende smeltse in een panne. Doeter dan soo vele stekelbesyen in datse bycans twee vyngeren hooch liggen ende laetse met de boter een weynich sieden tot datse maer recht hen coleur verloren hebben. Clopt dan wel cleyn 7, 8 ofte 9 eyeren met wat gengeber ende wat rooswaters. Gietet tsamen over de besyen ende latet so over een coolvyer backen dat niet en brande. Als de tasey genoech gebacken is, so laetse properlick uut de panne in de schotel rijsen datse niet en breke. Dan stroyter suycker ende caneel op ende dientse. To bake an omelette of gooseberries. Take fresh butter and melt it in a pan. Add so much goosberries that they are almost two fingers high, and let them simmer with the butter until they have lost their colour. Then beat 7, 8 or 9 eggs with a little ginger and rose water. 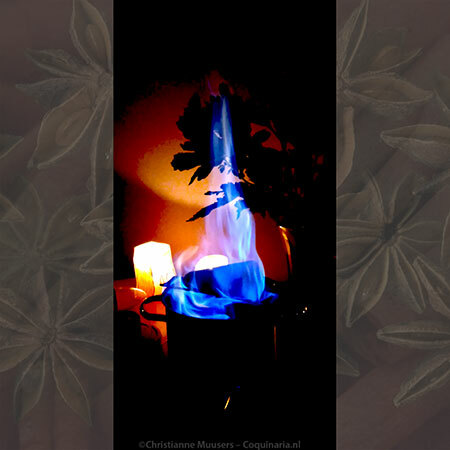 Pour together over the gooseberries, and let it bake over a coal fire without burning. When the omelette is done, let it glide from the pan onto a dish without breaking. Then sprinkle sugar and cinamon on it and serve. Compared to the recipes from the Viandier this is a simple one. But no less tasty. Gooseberries are available from June on, so this is an ideal recipe for the early summer. When they are plentiful, or you have your own gooseberry bush, you can freeze them so that you can make this omelette all year round. 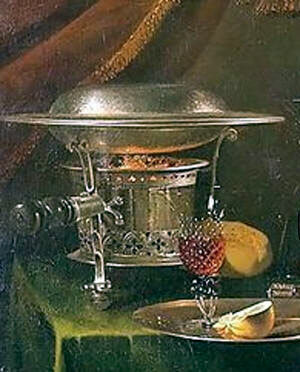 Another medieval Dutch recipe with gooseberries is broiled mackerel with gooseberry sauce. There you’ll find more information about gooseberries. VFirst course or side dish for 4 persons; preparation in advance 10 minutes; preparation 10 minutes. Clean and wash the gooseberries, remove any stalks. Beat the eggs with ginger powder and rosewater. Taste one of the berries. If it’s very sour, add some sugar to the eggs. Melt the butter in a frying pan that is not too large, take care that the butter does not turn brown. Add gooseberries, they should completely cover the bottom of the pan. Temper the heat, and stir the gooseberries around until they turn soft and start to lose their colour. Pour the beaten eggs over the berries, cover with a lid, and leave on a slow fire until the eggs are done. Slide the omelette onto a plate very carefully to keep it from breaking, and sprinkle with sugar and cinnamon. Cut the warm omelette into wedges. Gooseberries (Ribes grossularia) were not cultivated before the thirteenth century, but they are indigenous to Europe. Despite the English name, geese do not eat gooseberries. Some say that gooseberries are thus called because of the great combination of gooseberry saice with fatty meat, like that of goose or mackerel. In the north of France gooseberry sauce was a classic accompaniment to mackerel, a fatty fish (the French call the gooseberry groseille maquereau or mackerel berry). In the nineteenth century it was believed that the Dutch name kruisbes was derived from the Finding of the True Cross on May 3rd. But the medieval names stekelbesij and kroeselbesij (the modern word kruisbes is derived from this) indicate that it is the hairy skin that gave the berry its Dutch name. (likewise in German: Stachelbeere). 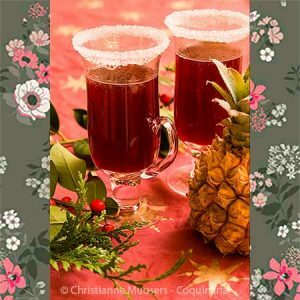 Carolus Battus, Medecynboec[…]. Hier is oock byghevoecht, eene seer excellenten, gheëxperimenteerden nieuwen Cocboeck. (Medicin Book. With added a very excellent, experienced new cookbook. Dordrecht, 1593 (online edition). This refreshing omelette can be prepared in the summer when gooseberries are plentiful and can be picked in the garden.